Social Security System or SSS is one of the government agencies considered by as one of tghe worst in providing public service. In fact, it shared the top spot with LTO in having the most number of complaints about red tape in 2017. I experienced this bad public service with SSS plenty of times. My top complaint is the very slow process that always result to long queues. The result is that I wasted plenty of time whenever I transact with SSS. There were times that I decided to go home because of the long line. Thankfully, SSS listens to the complaints of the public so they set up systems that will help the public. One of those systems is the Text SSS. 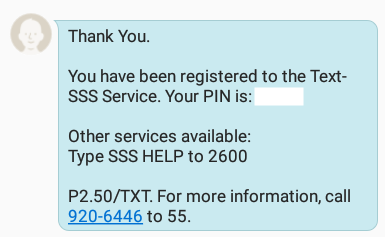 Take note that sending a message to Text SSS costs 2.50 pesos per message. The above message confirmed that my registration to Text SSS is successful. Text SSS is very useful for me. I was able to inquire about my SSS contributions and I was able to check if my last payment was received by SSS. So, if you are an SSS member, I highly recommend that you apply for Text SSS.